If Tully Blanchard and Marty Jannetty were able to someway, somehow produce a child, it would probably be a lot like independent pro wrestler Joey Ace. Cool, charismatic and calculating, Ace has the type of gimmick that suits him well- inspired by the cocky performances of Al Pacino, Ace thinks he’s better than everyone else, but then shows it in the ring, thanks to more than solid cardio, and a moves that contains a beautiful leaping Blockbuster finisher and an assortment of kicks and a Top Rope Elbow. However Ace is much more “what you see isn’t what you get.” Constantly in the gym as a personal trainer and armed with a historian’s appreciation for the business, wrestling is a huge part of his life. A former Warriors of Wrestling No Limits Champion and a Tag Team Champion, the 28-year-old’s day revolves around keeping himself in shape. 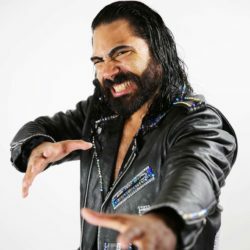 Currently performing mainly in the Staten Island-based WOW promotion, Ace has also performed on cards for G1, C4, Tier-1, Pro Wrestling Syndicate, Fighting Spirit Wrestling and FWE. Inspired by the work of Randy Savage, Shawn Michaels, AJ Styles and Christopher Daniels, Ace, who began wrestling 2009, is all about making every second of every day count. Armed with his “salty” work ethic, he’s got big time goals for his future.